This is just a minor note. I am using an UP! printer to do the parts for the InMoov robot. 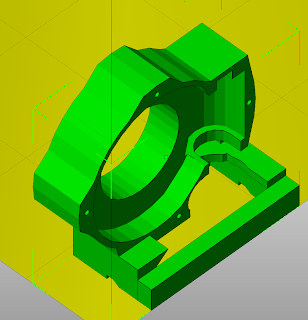 Fortunately, its 120x120x120 mm print volume had been sufficient to the task. Lately, however, I've encountered a bit of a problem since beefing up the gear box design for the shoulder and bicep. The UP! has an iron print base with heat applied in the center. Of course, you get a thermal gradient with such a design and the edges are considerably cooler than the center. The larger the footprint of a print the more likely you are to get lifting at one of the corners of the print. The new gearbox has a footprint of 110x120 mm when printed on the large flat side. It appears that that is about the limit for ABS printed on perf board. Two prints of the gearbox got noticeable lift on one corner of the print. These lifts were cosmetically annoying but did not compromise the functionality of the box. All the same, my aesthetic sense was offended, so I reoriented the print to rest on the new box structure that encloses the servo. This alteration reduced the footprint to 55x95 mm and does not cause corner curling on the UP! It does, however, require 40 minutes additional print time and uses about 8 cubic centimeters extra for support material. Here you can see the printed result. The UP! leverages the same print preparation software used in Delta Micro Factory's larger, professional printers. The sophistication of the support structures is readily apparent in the finished print. Removal of the paper-thin supports is a very simply matter.